Buildings, landscapes and materials serve as poignant reminders of our personal and collective heritage and history. Sites become palimpsests upon which layers of memory are recorded through time. This volume explores the issues of Difficult Memories and Reconciling Meaning and the negative associations, experiences and memories that are translated in a building, site or material. In the Early Twenties, Le Corbusier proclaimed his revolutionary manifesto by analyzing the light structure, pure form and practical spaces of the ship, extrapolating its qualities to define Modern Architecture.1 Ninety years later, with a globalized world, an international economic crisis, a planet in ecological agony and the challenge of Sustainability, a new spirit of Reuse and Adaptation is needed and a radical philosophy of transformation is to be defined. The post-industrial society requires an innovative model for a definitive Industrial Reconversion and the guidelines for the triggering of real urban recycling. Topography of trauma is a research project, started in 2008 in Europe as a recognition of sites affected and modified by different types of trauma, which then became a more detailed study focused on the Belice Valley in Sicily. This second phase of the research has been structured in two workshops, held in 2009 and 2010, across the Sicilian territories affected by an earthquake in 1968. The workshop activities generated a large narrative archive composed of both audio-visual and textual material, which has served to break down the palimpsest of the Belice landscape and then to reassemble and restore it in order to generate its critical representation. A Memorial’s historic destiny is to preserve the memory of the past and provide conditions for new responses. As our psycho-political and ethical companions, memorials should function as environments for thinking through past and present, fostering the appearance of a new critical consciousness in democratic public space. Memorial, Memento, Monument, like “Monitor”, or a guide, suggest not only commemoration, but also be aware, to mind and remind, warn, advise, and call for action. 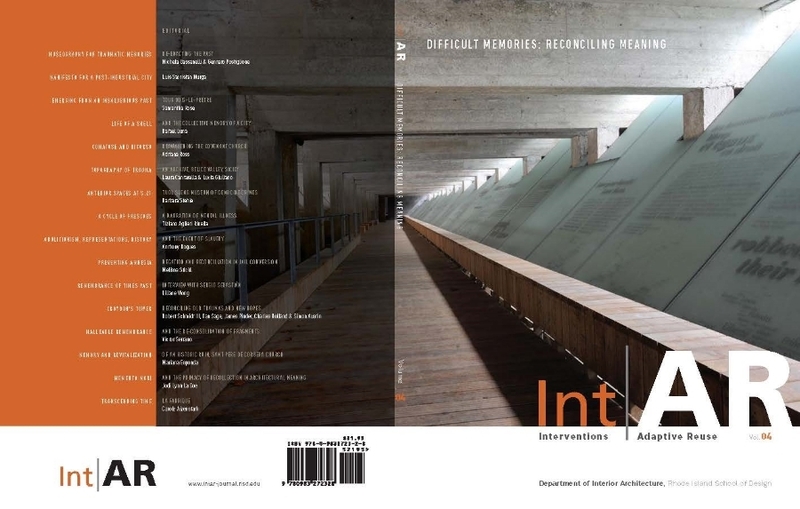 Int|AR, the journal of Interventions and Adaptive Reuse, is the official publication of the Department of Interior Architecture, Rhode Island School of Design and its editors Liliane Wong and Markus Berger. It is supported by members of the faculty, by the Department, its Division, the College and its Editorial Board.